We know one of the biggest factors you take into consideration when deciding on a wall mural is how difficult it might be to install. That’s why we’ve given you the option of our Peel & Stick self adhesive photo wallpaper. Peel & Stick features a permanent, water-based acrylic adhesive which is suitable for use on painted and/or plastered surfaces, making it INCREDIBLY easy to apply – just peel back the backing, position the wallpaper and press to the wall. No need to worry if you don’t get it right first time either. Peel & Stick can be repositioned without tearing thanks to its AMAZING durability – just peel it back and reapply. In our tests two people can wallpaper a standard sized wall in UNDER AN HOUR – and there’s NO MESS! No need for paste or tables means you can create a stunning wall mural quickly, easily and without the usual DRAMA of traditional wallpaper. 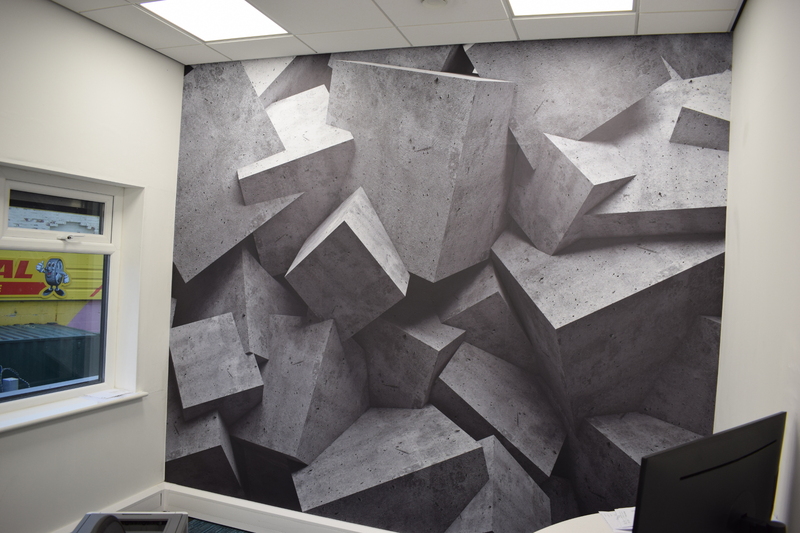 Peel & Stick installed in an office in Manchester – in under an hour! Peel & Stick is a permanent wallpaper solution, but if you change your mind a week, a month or a year later and fancy something new – this applies to the kids bedroom more often than not! – it’s SIMPLE TO REMOVE. Peel & Stick will simply peel off the wall, leaving little to no residue and WITHOUT the need for heavy scraping.